Owning a bottle of spearmint essential had long been a dream of mine. When I could afford it, either I didn’t think about it or my suppliers didn’t have it. When I couldn’t justify the expense… Well, there ya go. Finally, last month things aligned so that I could barely justify it when it was time to restock lavender oil, so I went ahead and splurged. The bottles of oil came and… Ohhhhhhh!!! One whiff of the spearmint oil and I was blasted away in a zippedy-doo-dah moment of euphoria. The scent was pure, crisp mint that brings to mind amazing chewing gum and carried memories of my grandma’s out-of-control mint bed that wasted little time racing from its spot near their pool in the back up to the driveway. Suffice it to say, I was blissed out! I’d been yearning for this spearmint oil for one simple reason: To make a spearmint-peppermint swirled soap. But how to design it? Then my Facebook memories reminded me of this stunning black and white mantra swirl I’d done ages ago and I thought, Why not? It’d been years since I’d done that particular design last, and it wasn’t particularly hard to do. This is that swirl coming to be. Sure, this soap is fabulous from the top side, but what about the slices? Unfortunately, you have to wait to see that as the soap is still a bit soft to unmould. The best places to check it out are my Facebook page and my Instagram feed; I’ll be showing off the slices around Friday of this week. It’s just two days away! I hope you enjoyed this behind-the-scenes view of a swirl coming together. These beauties will be ready to add some zippedy to your doo-dah in less than 4 weeks. Be sure we’re landing in your inbox because email subscribers get first dibs on all new products. I just received a new fragrance today to try, so that’ll be one of my next soaps to show off to you. This week, I’m going to let video rule the post. A couple of weeks ago, I made and poured a batch of Outer Banks Beer Soap. 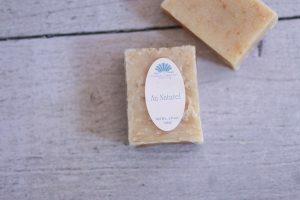 I didn’t record the making of this soap, because no one wants to watch saturated fats melt (5 minutes of boredom) or my mixing the soap (30-60 seconds of noisy boredom). Here I’m showing the pouring of this soap followed by the slicing of it. So, what do you think of this little sneak peek? I don’t do them often, but every now and then, it’s fun showing off how we make the magic that we do. Summer is rapidly approaching, and with warmer temperatures, we’re showing more skin. Our skin is our largest organ, and like our other organs, it, too, has its care needs so that it can do its job. I’ve come up with five not-terribly-original ways to care for your skin. (1) Sweat it out. When we sweat, our pores open up, allowing the sweat to flow out, taking with it dirt, oil, and other blemish-causing culprits. Sweat also removes toxins from the body, making it an incredible, completely natural detox method. (2) Water in, water out. No news here – we’re approximately 70% water. In order for sweat (and urine, for that matter) to do its best job removing toxins and impurities from our bodies, it has to have something to work with. Drinking plenty of water (half your body weight in ounces is recommended, but at least shoot for 6-8 cups) each day gives your body what it needs to function, as well as providing the conduit for sweat to work. Being well hydrated is like moisturizing your skin from the inside. (3) Kiss the caffeine good-bye. Do you live your life a cup of coffee or a can of soda at a time, just to get through your day? While moderate amounts of caffeine can’t hurt – some studies suggest they’re quite beneficial – there is such a thing as too much of a good thing. Caffeine acts as a diuretic, and while your body might be eliminating water, if your entire drink consumption is primarily caffeinated drinks, there isn’t a grand amount of water going back in. As a result, you’ll end up terribly dehydrated. This results in dry skin that lacks elasticity. (4) Bid those smokes a farewell while you’re at it. It is often easy to determine the smokers in the crowd before you even smell them. They have fine lines around their mouths and they look older than their years. That cigarette smoke is chemical-laced dry heat in the face constantly. (5) Slather on the sunscreen. Oft-repeated, seldom followed, and I’m admitting now that I’m not the best about this, though I am getting better. There is no undoing the damage from sun over-exposure or smoking without lots of medical intervention – maybe. I always wear sunscreen at the beach with frequent reapplication, and I am doing better about remembering to put it on on soccer days. I still, however, don’t put it on every time I go out, nor do I wear it when I’m taking walks or rides (usually later in the day when the UV index is low). (6) Use soap and moisturizer. Soap keeps the skin clean (obviously). When we wash with soap, the soap bonds with the dirt and germs on our skin; then, when we rinse, all of it washes down the drain. Our skin’s acid mantle restores itself in 2-3 hours, bringing balance back to its pH. By washing, we get rid of germs that could enter even the most microscopic of cuts. When we follow with moisturizer, we keep the skin soft and supple, which makes it heal faster and more easily. I discovered when I was in graduate school that small sores such as paper cuts took much longer to heal during the dry winter months than they did in the moister summer months. Applying lotion to my hands sped up the healing time. I talked about this this morning in my branded Facebook group. Are you a member? We’d love to have you join us! Just click that link (“branded Facebook group”) and submit your request to join. And in the meantime, get some water into you and sweat some water out. Your skin will thank you for it! You can read the first part of this saga here, and the second part here. I was sitting at the beach, and I’d lucked out on a bench swing overlooking the ocean. The air was nippy (it was April), the water was a beautiful greenish blue, the sky was a crystal clear gradient blue, and the wind whispered through the sea oats on the dunes. I closed my eyes and allowed my other senses to study my environment. My mind went back to countless beach days – warm beach, friendly kids for the girls to play with, sand in the bathing suit (hey, it happens), sunscreen. And there it was. I would make soaps that capture by scent my memories and associations of various North Carolina beaches, and this would be my niche. 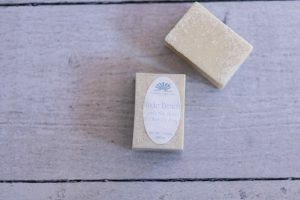 I already had been making one soap, Crystal Coast Morning, that was inspired by wonderful memories of waking up at Emerald Isle in the late autumn (think early December) when the air is clean and brisk and the beach is silent but for the waves and breezes. Kure Beach is kissed with a bit of sunscreen and a little sand. Outer Banks is wild and primitive – sudden storms, cedar-sided houses, the ghosts of pirates. And Ocean Isle has a hint of fruity drink (with an umbrella, of course) served ocean-side. These four soaps form the heart of my new niche. A surprise gift of 5 pounds of Bolivian pink sand were the inspiration behind a new type of salt scrub, also in these fabulous scents (though, being a “man scent,” Outer Banks isn’t yet available in salt scrub). You know how your skin feels after you’ve been at the beach? That fine layer of sand exfoliates your skin as you wash it off. Then you wash off all the sunscreen and salt, slathering on the lotion afterwards, and you feel sun-kissed, moisturized, and completely luxurious. That’s what Bolivian Pink Sea Salt Scrub does for your skin. From my niche came my conception of my ideal customer. It was the oddest thing. I was transferring soaps from table to rack late one night before bed, and I started talking to her in my mind. In a flash, my ideal customer came to me, and I knew everything about her. Experts put out worksheets to help businesses identify their ideal customer, but I kept getting stuck when I’d do them. Apparently, though, at 11:00 while I’m doing mindless tasks, I can come up with lots. Anyway, moving on… (I just get really excited about my new products, if you couldn’t tell!) We’re moving forward on this rebrand, right? I had the blessing of 1 1/2 weeks without the girls to make products, take pictures, talk to my web developer. Things were looking good! I would take a few pictures a day as soaps cured and were close to being ready for sale. My web developer and I worked hard, troubleshooting and setting things in place. The launch date was 1 June, and I was trusting him to be working his coding magic behind the scenes while I dealt with the front-end and administrative tasks. Then another one of those screeching halts came at the end of May. My husband and I both lost two people close to us – his mentor/friend and my grandmother. My work time was then pushed into traveling, and I pushed the launch for the following Monday, giving us the weekend for final tweaks and adjustments. I wasn’t hearing anything much from my developer, so I took deep breaths and trusted that all was going fine on his end. Then Monday comes. And Monday goes. No website, and nothing at all from my developer. It’s like he’d dropped off the face of the earth. Panic ensued. If this site was going to be ready for the grand new business launch, I was (a) going to have to build it myself, or (b) pay someone big bucks to build it for me. I knew I couldn’t afford option B, so A it was. I started with my shopping cart, a trusted one that I’d used for years with my old site. I was familiar with the admin, was pretty comfortable navigating the cpanel, and I was ready to roll. The first problem hits. No big. I go to the support forums, find the solution, fix the problem, roll on. The next problem crops up. Same thing. By the third problem, I had figured out I was in over my head and started exploring other shopping carts. Getting started and through the first three problems took me… probably about 20 hours to deal with, and I hadn’t gotten very far at all. I found a new shopping cart, scrapped those twenty hours’ worth of work, installed the new cart, and after about another six hours’ work, had a rough but working website. Score one for the not-developer! Several more hours, messages between the shop’s developer and me, even more hours, and the site was done and ready to launch a little over a week later. Given that website development really isn’t my forte’ at all, I really have to be proud of the fact that the launch was only delayed by two weeks, and for the most part, I built my site by myself (though again, with valuable help from the template developer’s team and my own friend Bobby). My web developer is still MIA. Even while all that was going on, I ordered note cards, postcards, and business cards. I invested time in sending personal notes to some of my customers. I set up email addresses… And to my surprise, last Monday, one of my customers who received one of those notes talked about it in her own blog. You can read about that here. So, that was pretty much my rebrand, start to present. There’s so much minutiae to doing this – opening new accounts, changing account information on websites, making it official with the state – but that’s boring stuff. However, if you’re rebranding or launching your first new brand (the steps are quite similar), be sure to include these tedious but necessary tasks on your task list so you don’t forget them. If you have questions about rebranding I didn’t address, please leave them in the comments below. That’s a fair question, certainly. Soap A (the less expensive one) requires a one-time pour with mica accents finger-brushed on top. Soap B (the soap in question) COULD just take a one-time pour of a single color of soap, but this customer was expecting it to be colorful, and “colorful” meant several individual pours of different colored soap. This took time, and since I’m a professional, time = money. And I had to craft each soap individually. And as I make slabs of soaps, the types I can whip up in one glorious pour, I think of what it takes to make various soaps. I’ve made soaps before that are a simple scent and no color, or a scent and just one color. Those are quick and simple to make. Then there are the soaps with elaborate swirls and multiple colors, or soaps that contain interesting botanicals and custom created fragrance blends. Truth is, I could whip out batch after batch of no-color scented soap, but that would be so boring! We LOVE color! And design and fun, unique fragrances, and everything else we bring to our soaps! But creativity, again, takes time, and time is money, even when you enjoy what you do. I tripped across this great video today that takes a look at the relationship between time and creativity. Sure, creativity takes more time to achieve, but we are infinitely more pleased with our results. We’ll continue to take the time to be creative, because it’s just so much more fun. I thought that I would change up my blog. I was thinking of one of my friends at the time I was writing this and decided that I would act as if I was talking to her and came up with questions she might ask. Hope this answers some of your questions! Friend: What does the soap look like? Me: The soap is pink with a fun amount of sparkles and a mango sorbet fragrance. With it being my first soap I would add a hint of blue to the pink color in the future. Mom says that I should start with one color, but I added sparkles to get close to the desired effect. Friend: What good qualities does your soap have that will make people want it? Me: It will be a small bar which will be easy for kids (and adults) to hold. Its fun fragrance will (ahem, should) make kids look forward to showering without bubblegum (take it from a young spurt, bubblegum can smell icky or get tiring). The soap has sparkles which gleam in the light some. It is very moisturizing, lather is a definite, and it is hard. I was rinsing off my cutting board after cutting it and I had a great lather. I love the soap (I kept a bar for myself). Friend: If you were to sell it, what would you call it? Me: Pink Paradise* or Pink Paradise Falls**. I’m leaning towards PPF, though if I do PP then I can do a series with Blue Paradise, Green, Orange, Purple, etc. I think that I’ll make another PP next year for sale, then every other month another color. I will be doing another soap (for sale) this year with the same recipe, and it will be Christmas-y. That will be sold online and at the Triangle area EPA show in November. I also do a show here called the Pender County Spring Fest. Friend: How did you think the soap would turn out compared to how it turned out? Me: I thought it would turn out sharper, more vivid, pinker. The top looks pretty and if the whole soap were that color, then the soap would look beautiful. The top is a powdery pink that, in my opinion, looks like pixie dust. The bottom is a sort of magenta, but not that dark, mixed with sparkles that add a welcoming touch. I really thought that the sparkles would come out more, that it would be darker or lighter. Friend: What were some of your feelings as you made this soap? Me, mixing up the lye. Me: I was feeling exhilarated, happy, worried, slightly panicked, joyful, and free. I can make whatever I want (within reason) on any soap, swirl, etc. I was also very happy that Mom said I could. Truth be told, I don’t like Melt & Pour as much. They take up time freezing them and you have to monitor it. You can make a CP and leave it alone. Me stirring the lye mixture into the warm oils. Making magic happen! Friend: Give us some brief how-to’s. Me: First, gather your supplies. Since I’m doing small batches then everything can be done in a 4 Cup measuring cup. Bigger batches are done in buckets. Not all of your oils are going to be liquid. Put on your goggles, gloves, etc. and get the smaller container. Measure out your lye. In the big container, measure out your water (or ice). With the wooden spoon stir lye and water together but be sure to hold your breath; otherwise the fumes can hurt your throat. Once dissolved, set aside. You can take the protective gear off. Now measure out your solid oils. Mine were coconut, palm, and cocoa butter. Melt them in the microwave until liquid. Now you add your liquid oils. Mine were olive and avocado. Mix all your oils together and set them aside. Take another small container and scoop some of the oil mixture into it. Add your color to it and stir until smooth. Set your color aside. Measure out your fragrance and set aside. Put your protective gear back on. Dump lye mixture into the oils. Take the stick blender and bring the mixture to a trace. It will be mixed together but thick. If you’re making tomato soup and it’s just out of the can, that’s about how thick it should be. Add the fragrance. Now you have one of two options. The soap will be a creamy white. You can add the color mixture now and stir the fragrance and color in, OR, you can stir in fragrance then add color. If you do option #2 then you have the option of not stirring the color in all the way and getting a swirl. Either way, when you get done, put it in a silicone mould, scrape it out (this is where the spatula comes in), and cover it with a box lined with cling wrap. Insulate your soap by covering it with towels and let rest for at least 24 hours before unmoulding. Take the soap rag and wipe your equipment before rinsing under warm water. “Make” it in a soap program and it should tell you how many days it has to cure (you can use it after it cures, usually about a month). Posted on September 25, 2015 Categories Bath and Body, DIY, Mary's Thoughts, SoapsTags business, CEO kid, cold process, DIY, entrepreneur, soap, soapmaking2 Comments on My First Cold Process!